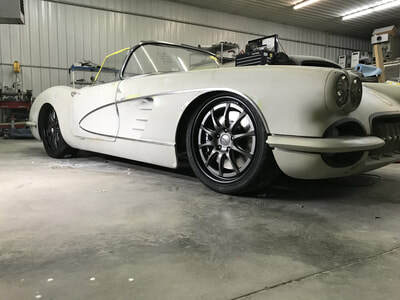 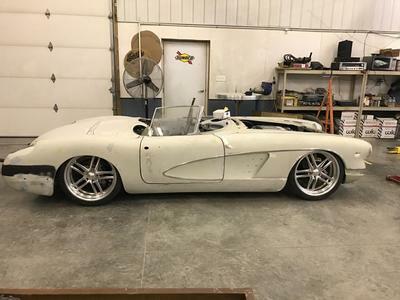 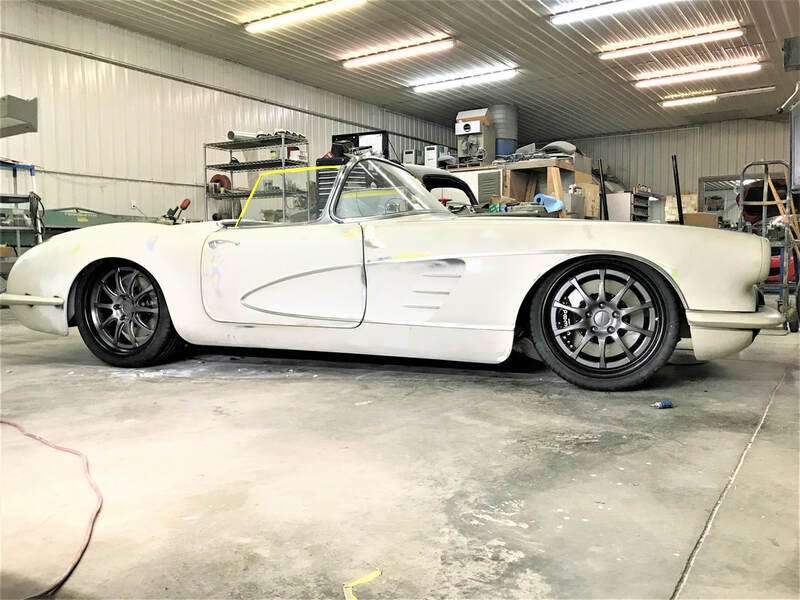 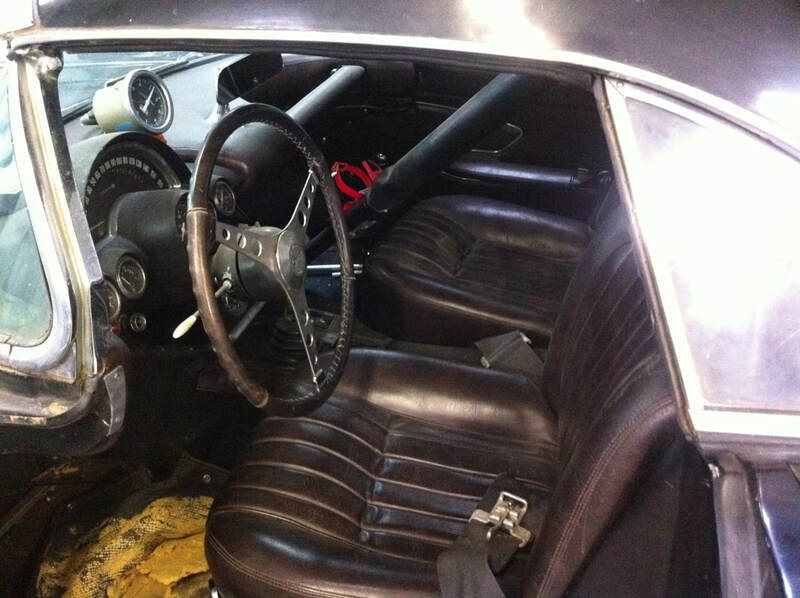 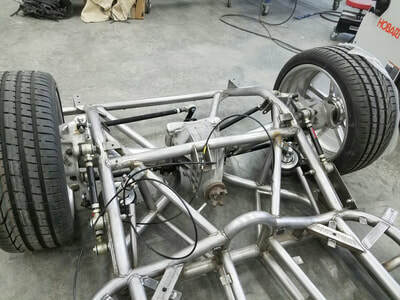 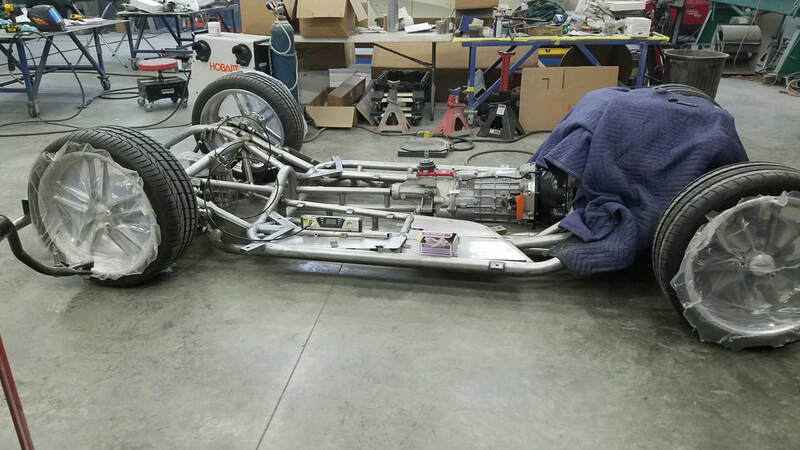 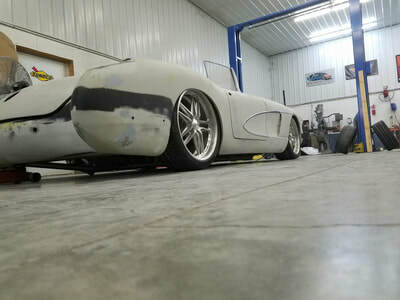 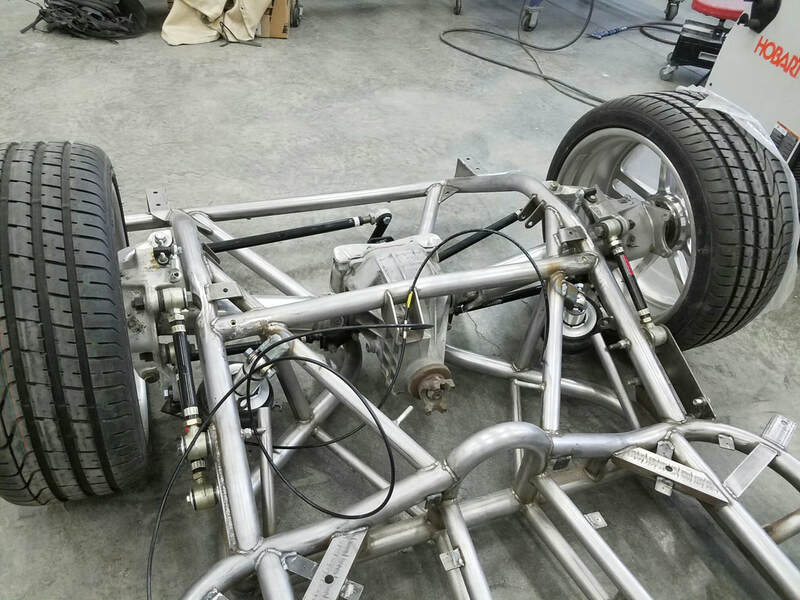 Check out this project that lived its life as a cool old school 59 Corvette dragster. 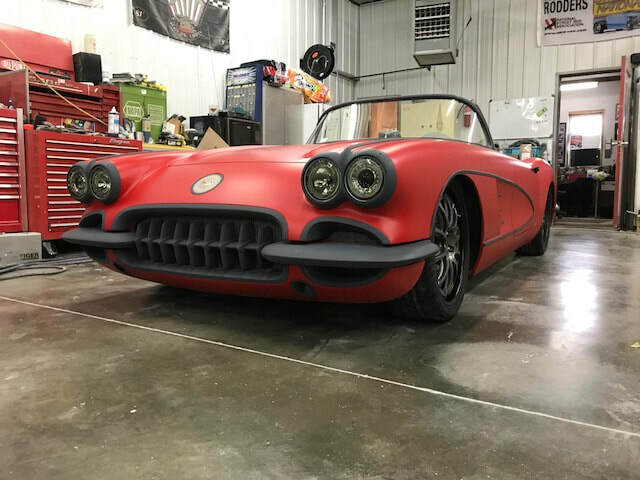 This will be a high level resto-mod build with all the best components and lots of custom mods. 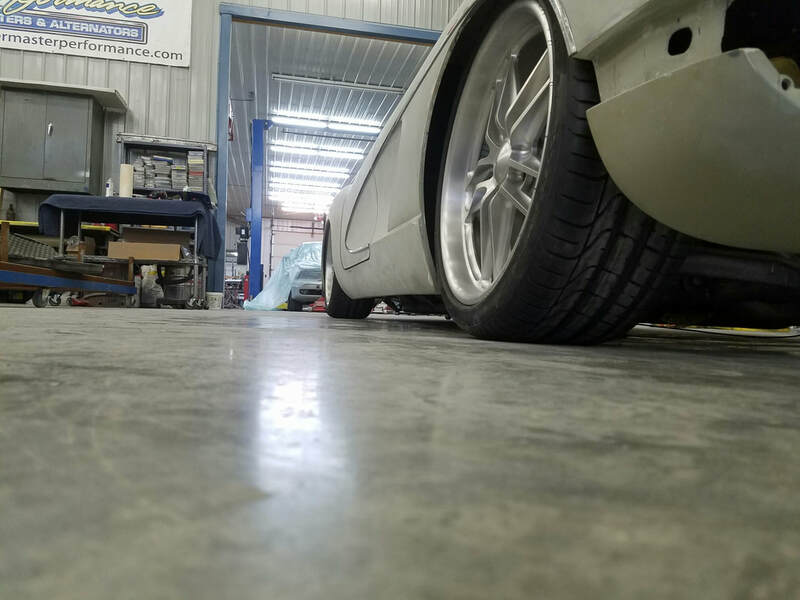 We’ve already gotten well into it so expect a lot of pics for this build! 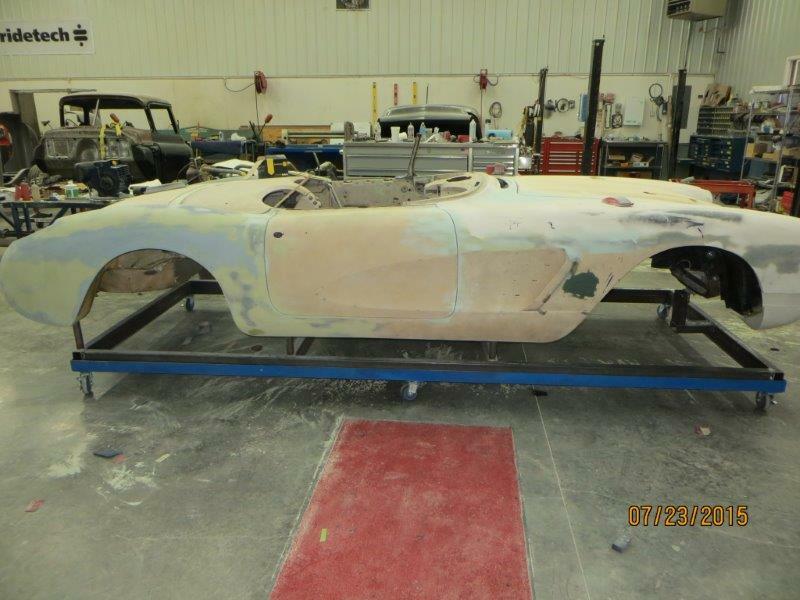 Excited about the SRIII Motorsports Chassis for the ’59 Corvette build! 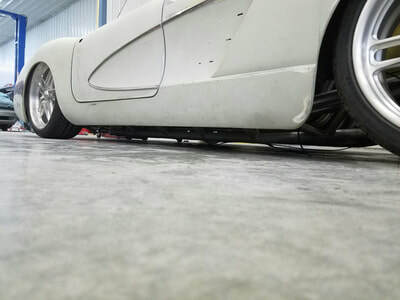 Working on a custom air ride application with RideTech, should fit the desired need for drivability and track performance! 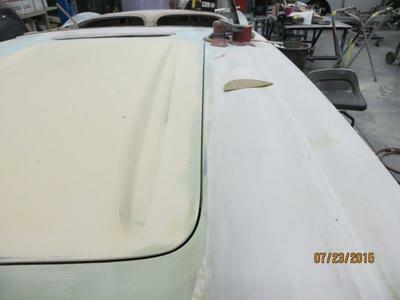 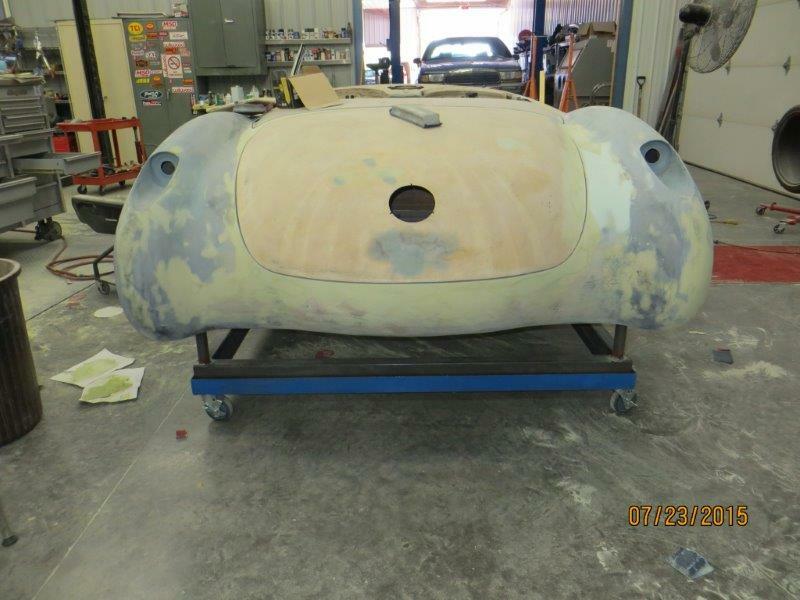 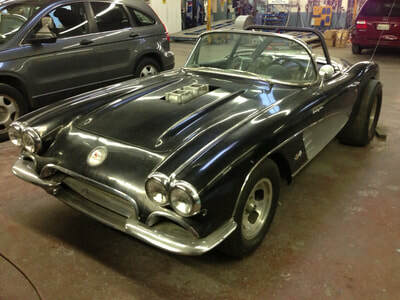 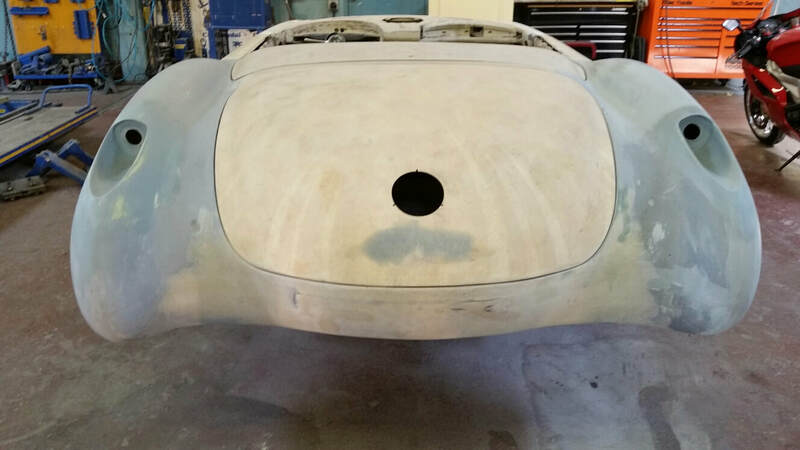 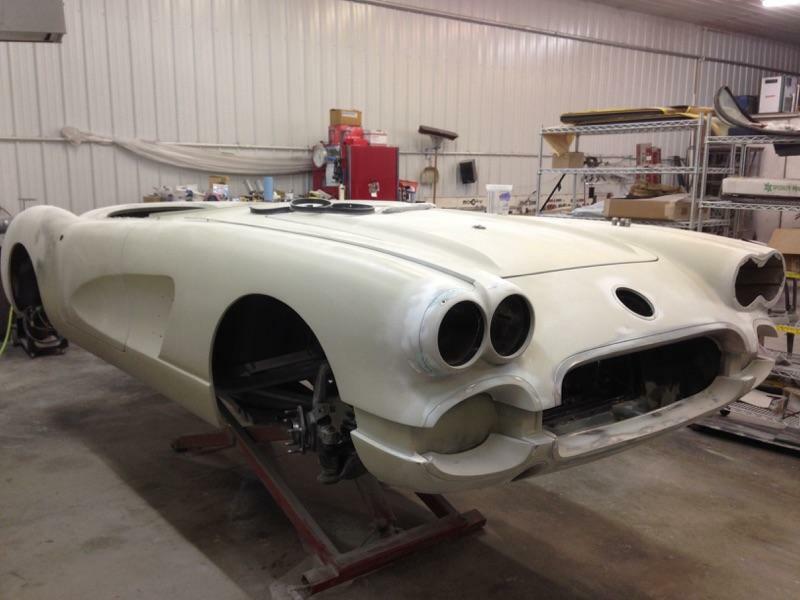 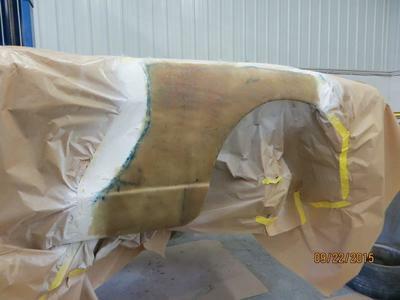 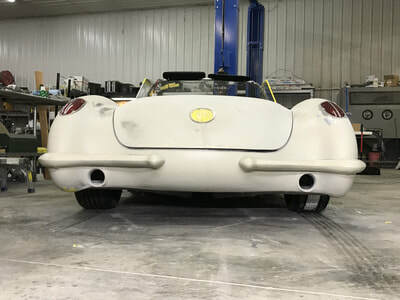 Really excited about some of the body mods were making to the ’59 Vette project. 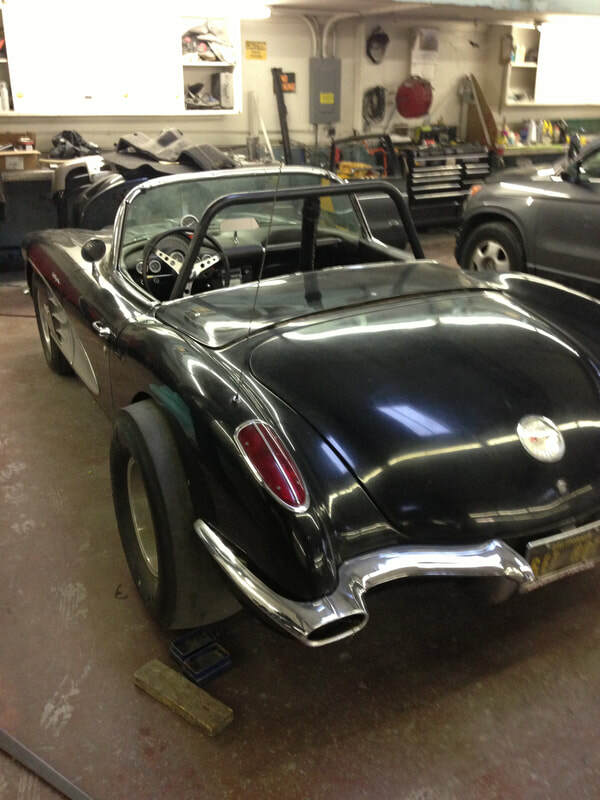 Definitely working to keep all the classiness of the original C1 but making a few awesome tweaks. 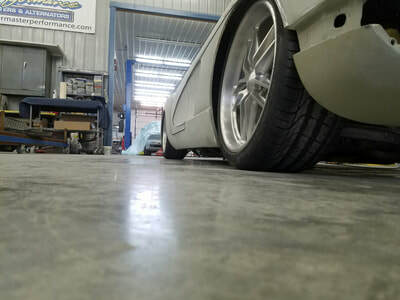 Check out the fender mods, along with the stance we have planned for the build this will give it a great strong aggressive look. 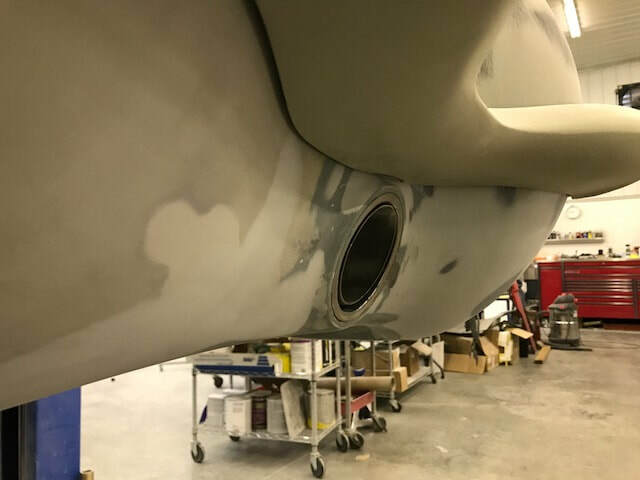 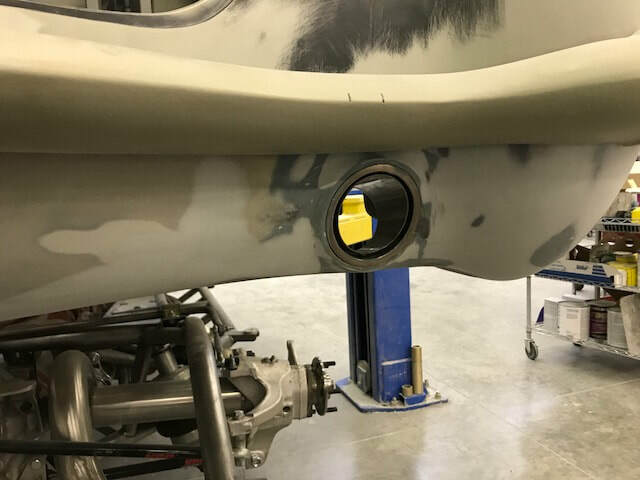 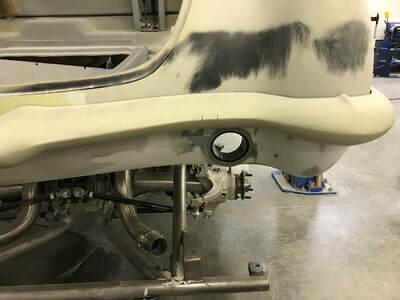 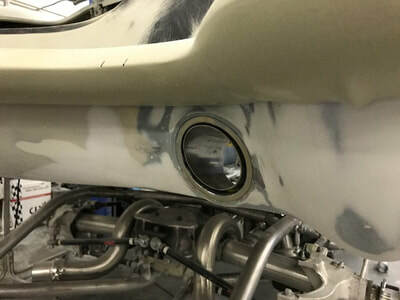 Check out the custom exhaust ports on the C1 project! We closed off the old ports to create a custom bumper package, more to come on that later. 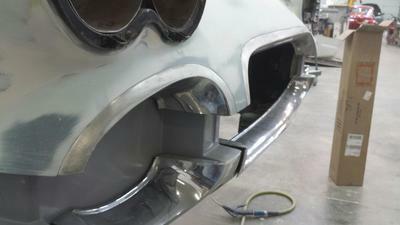 And we kept it in the “original” family by fabricating the new port cans from actual tail light bezels off of a ’61 C1. 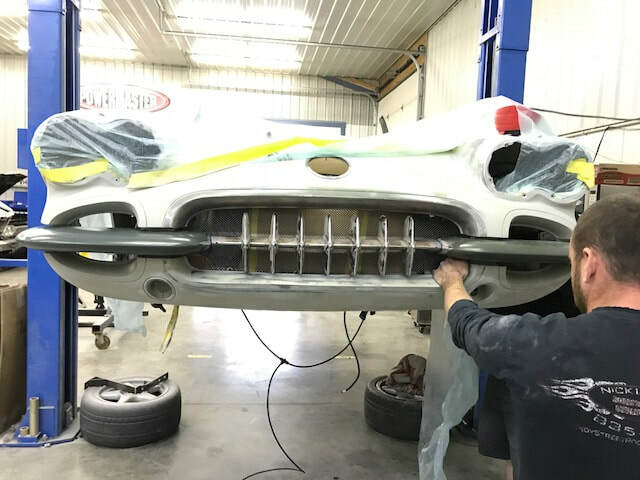 This customization allows for the impressive 3” stainless exhaust this build will need…which hints to the power that will be under the hood! We have high standards - With every build here at ISRC we focus on the tiniest of details so the fit and finish are superb. 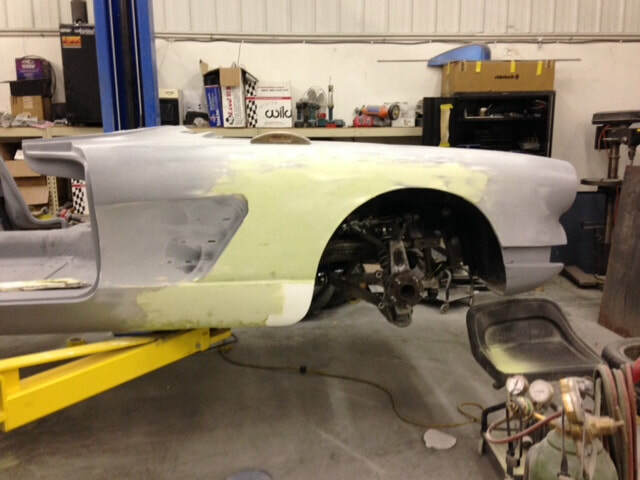 This week we are showing our first pass at getting the gaps just perfect on this C1. As the build progresses we will revisit the gaps again and again so the final body is laser perfect. 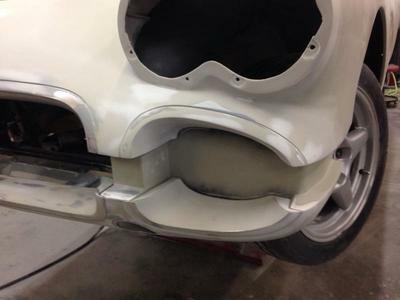 Next time you are at a car show, check out door, hood, and trunk gaps, and you'll see what we mean. 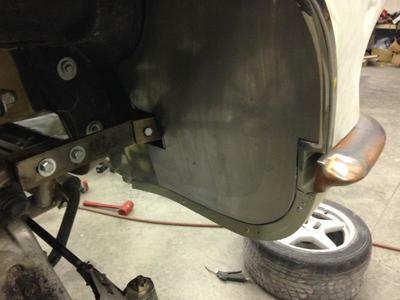 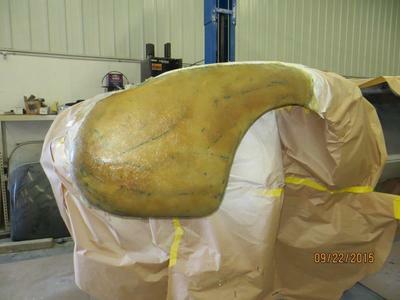 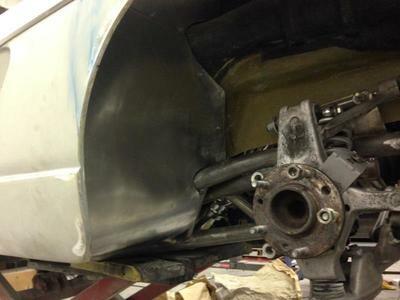 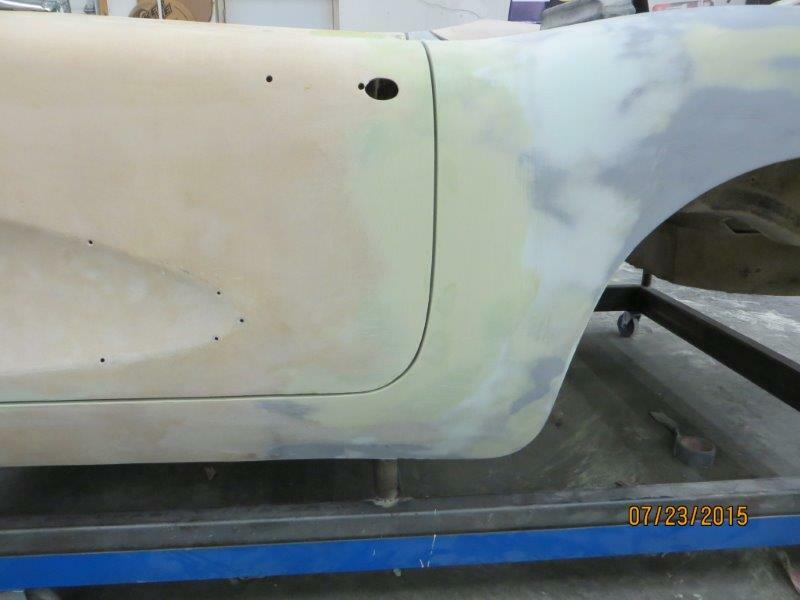 Reshaping the fender wells on the C1 project then requires fabricated inner fenders, check out the progress. 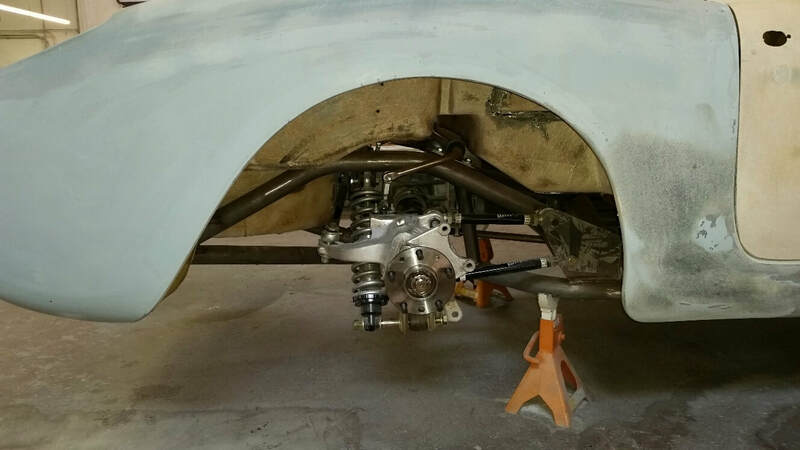 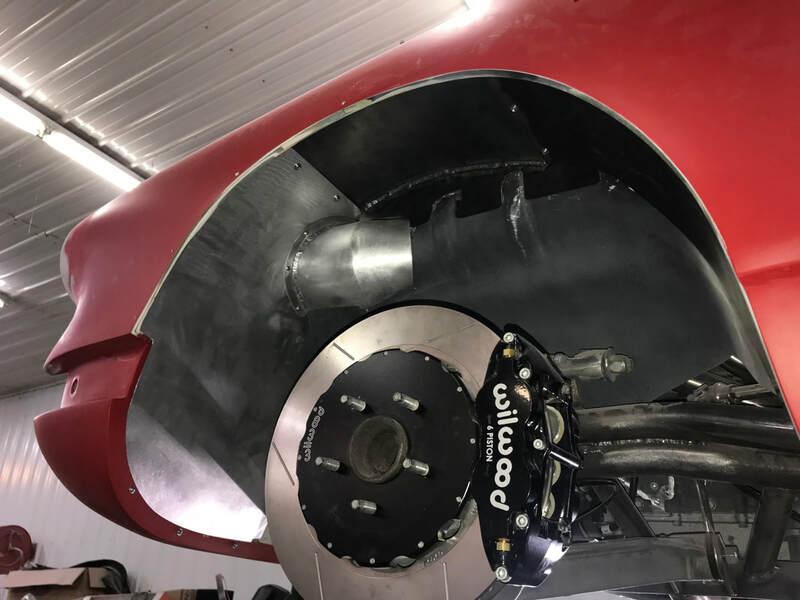 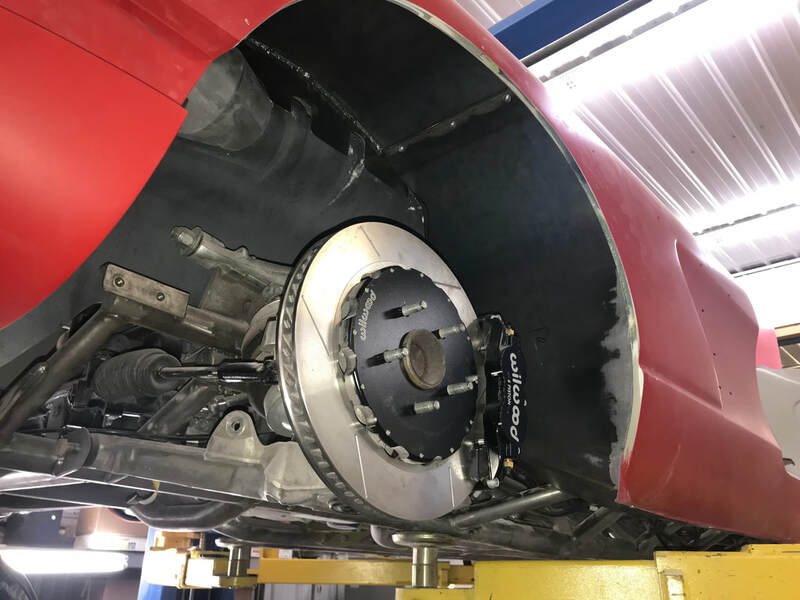 You can also get a glimpse of the stopping power we are putting in to this build with these impressive Wilwood brakes. 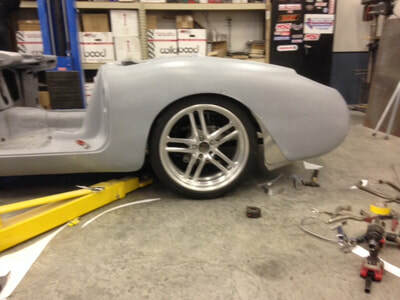 Appreciate partners like Wilwood at help work out the best solutions. Another C1 project update. 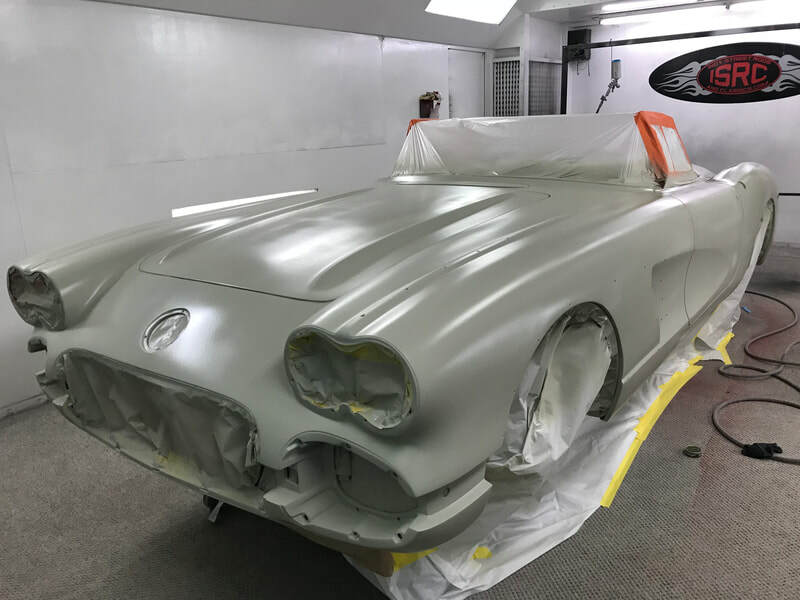 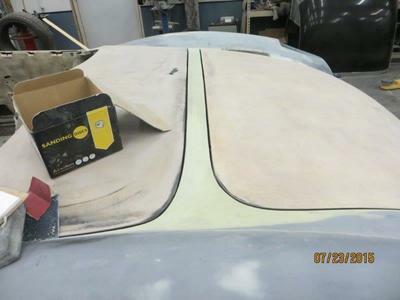 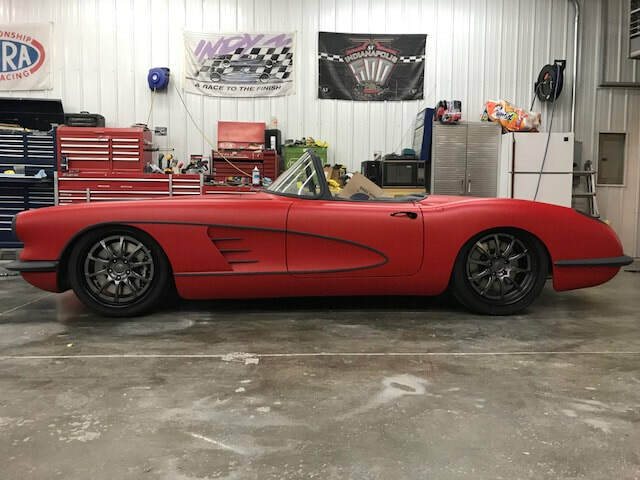 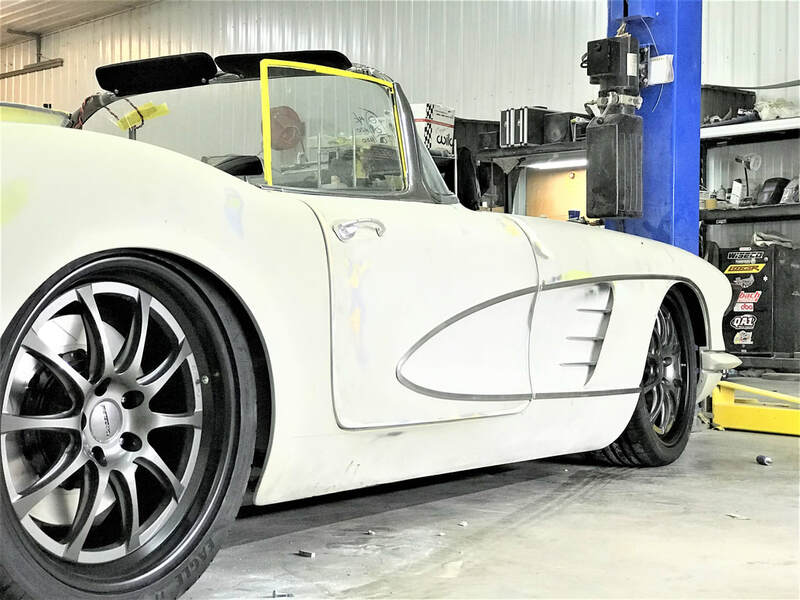 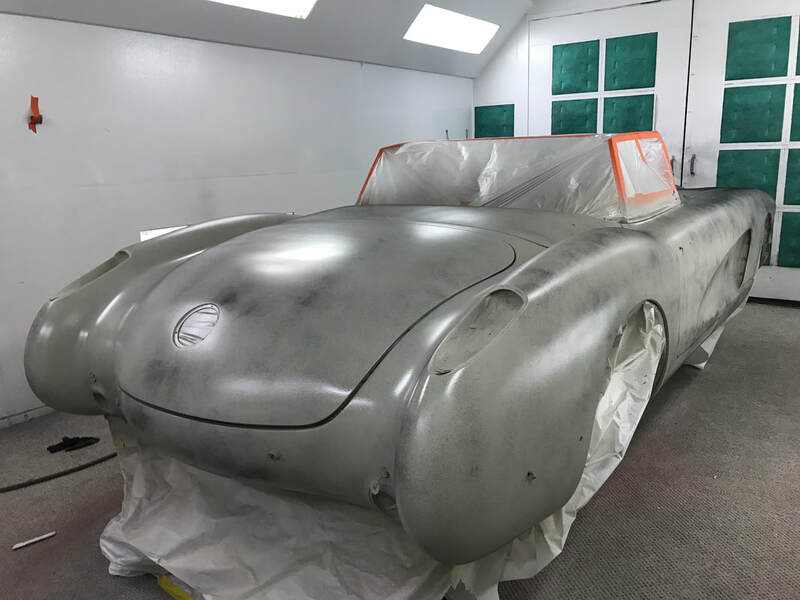 We have something special planned for the trim on this Vette which allows us to get creative and to really get the body and trim precisely mated together. 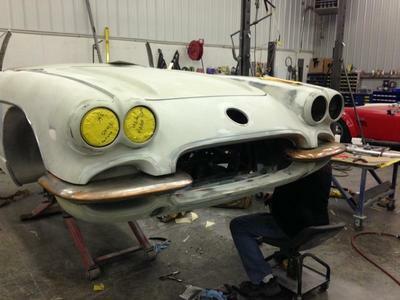 Should be a very sleek beast when fully completed. 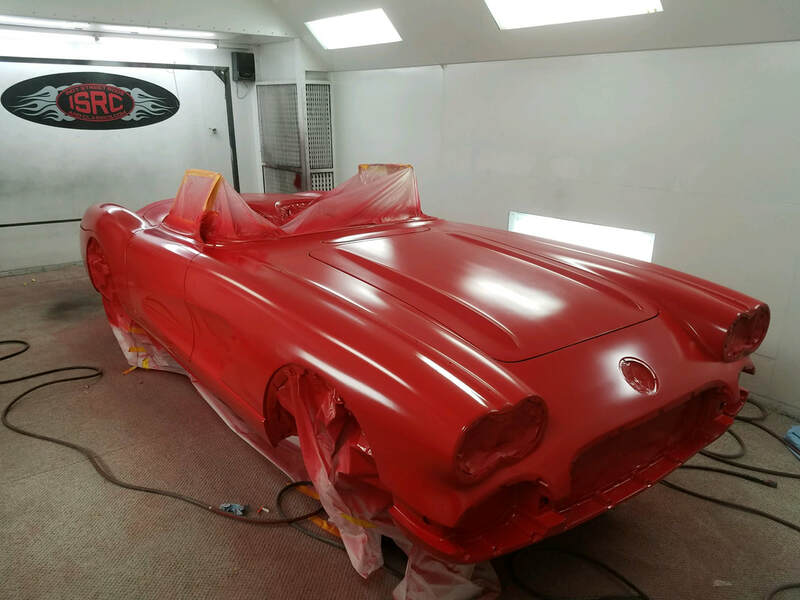 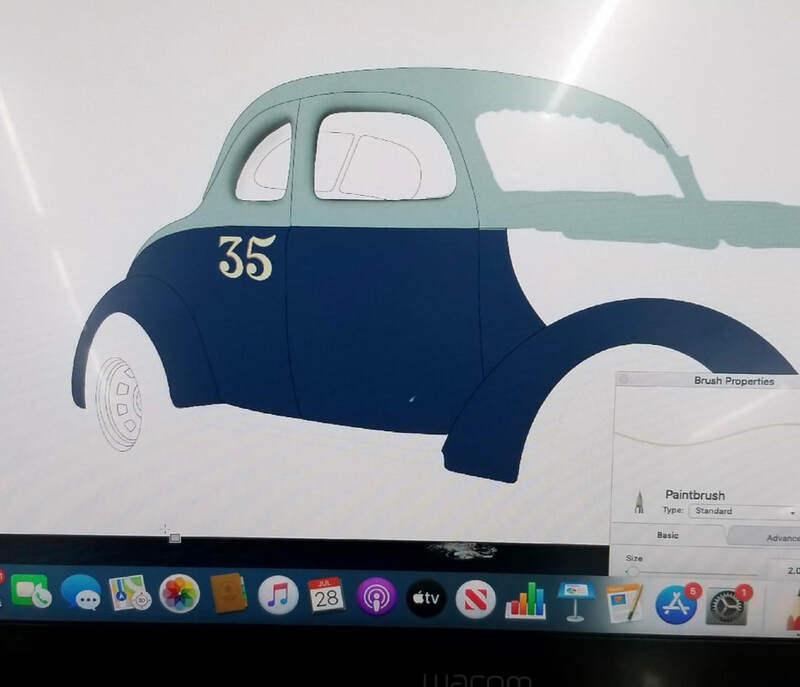 More on the C1 Project! 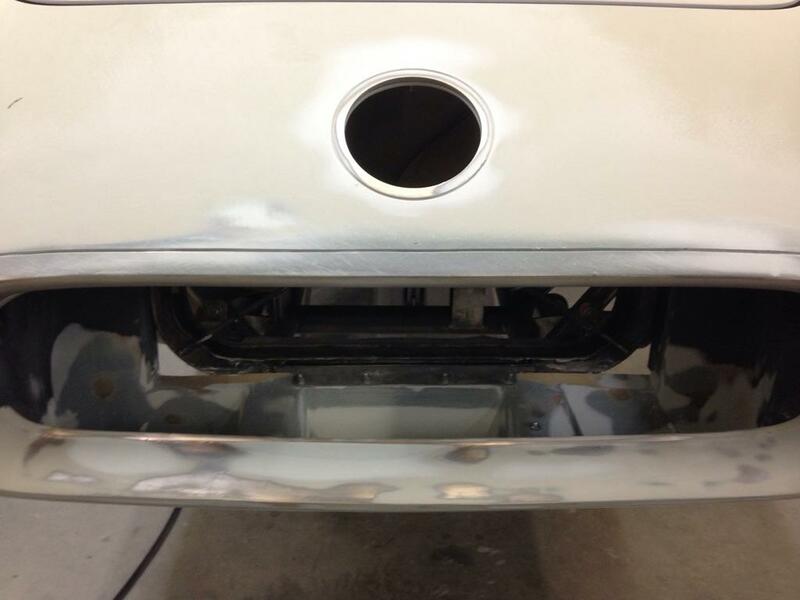 Check out the custom fabricated bumpers front and rear. The front bumper and grill is now one solid piece versus the original bucket of parts, bolts and nuts! 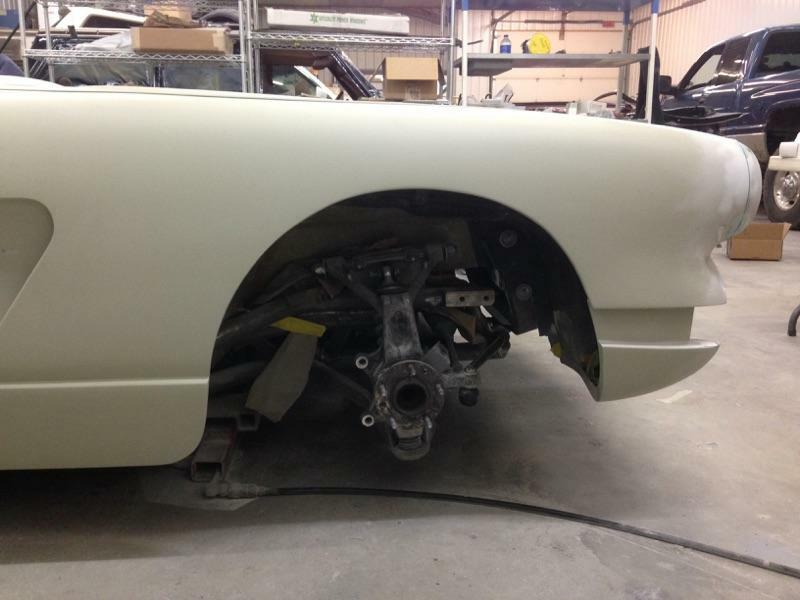 The rear is significantly changed to work well with the modified exhaust ports. 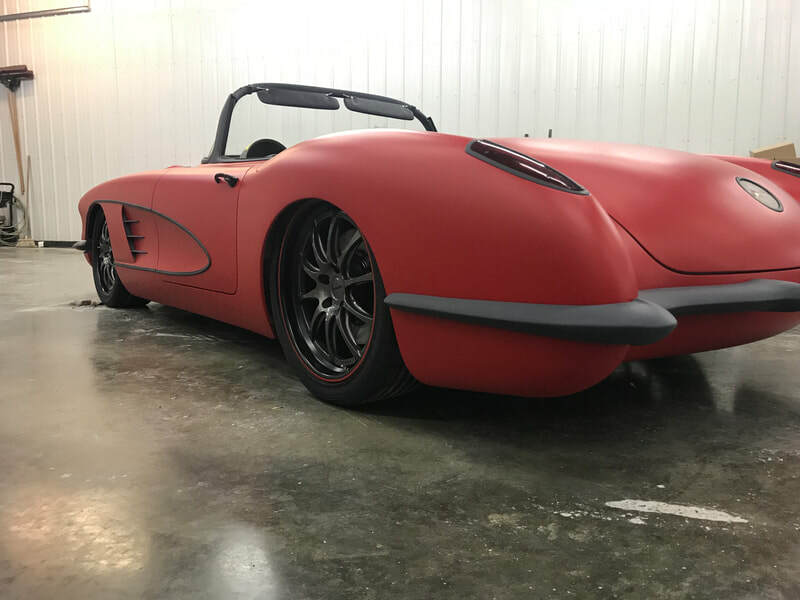 Again, not stock, but maintaining the classy coolness of this C1! Stance often makes or breaks a build, and working with RideTech to tweak this one just right will be great fun. Looking pretty good already from our perspective…maybe just a tad lower? 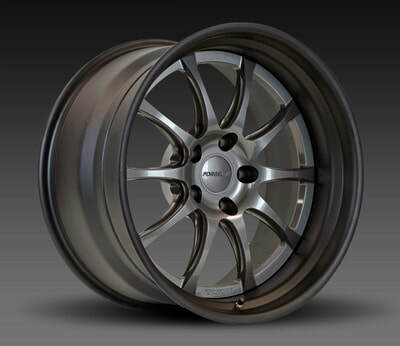 (haha) By the way, these are just mock up wheels - you will see the actual wheels in a coming post! The wheel reveal for the C1 project. This Vette will be a beast of a performer demanding true track wheels so we went with Forgeline, Satin black barrels and gun metal grey centers. Wait till you see what these look like with the color scheme we have planned! 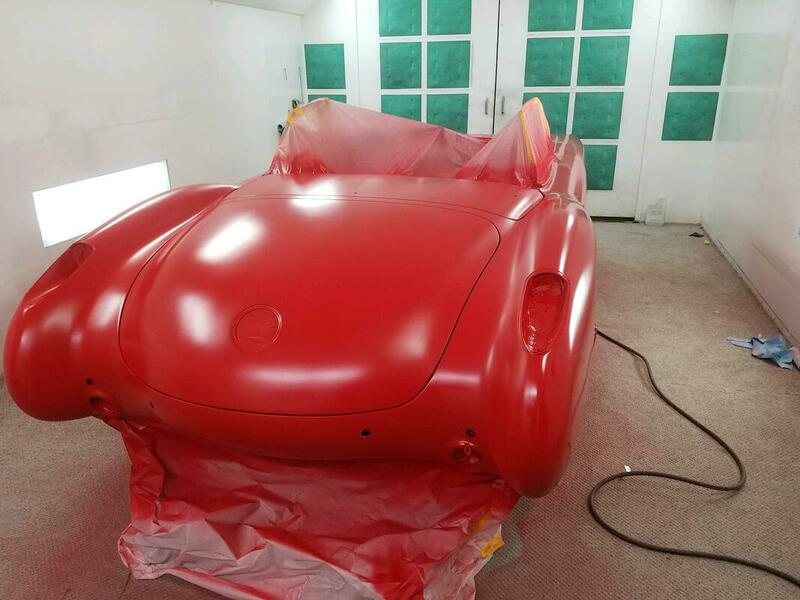 Sneak peak for the C1 project's color. It's flat for now but has not seen the last of the blocking and priming process.